As most fans know, the Camaro was introduced to counter the runaway sales success of Ford’s Mustang. Chevrolet’s top brass wanted to best their crosstown rivals, but they were wary of threatening the status of their Corvette as the pinnacle of Chevy performance. They had to thread a needle by making the Camaro faster than a Mustang but not quite as fast as a Corvette. This was further reinforced by a GM corporate edict in place that decreed no GM model smaller than full-size could have an engine larger than 400 cubic inches—except the Corvette. That meant that the Camaro’s top factory-engine option would be the 375hp 396—deemed more than sufficient to counter the 325hp 390 that was the 1967 Mustang’s most formidable option. But of course, Ford had Shelby, which introduced the GT500 in 1967—stuffed with Ford’s 428 Police Interceptor big block that made an estimated 400hp. Fortunately for Chevy fans, they had Don Yenko. The Canonsburg, Penn­sylvania, Chevy dealer had been in business since 1949, and as a drag racer himself in the 1950s, Yenko opened a performance shop attached to the dealership and developed a reputation as a go-to source for go-fast parts for the bowtie brand. 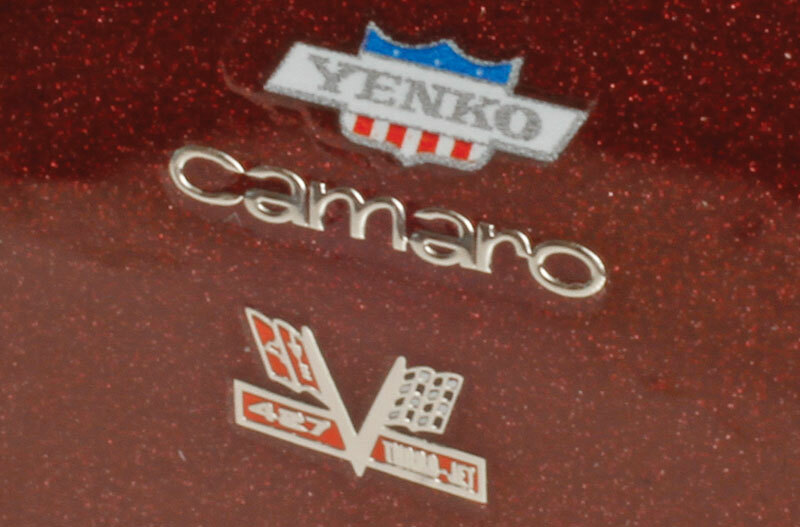 But it was the introduction of the Camaro in 1967 that elevated the Yenko name around the world. Knowing that all the Chevy big blocks shared the same architecture, dimensions, and accessories, Yenko figured he could order a bunch of 396 Camaros, convert them in his shop by swapping in the 427 cubic-inch L72 from the Corvette, and sell the Camaro that Chevy should have made from the factory! The installations were professionally done and so pristine they even looked factory—except for the sticker on the open-element air cleaner that announced this Camaro had 450hp! And as a race-prep shop, Yenko also added headers, uprated ignition, and various other tweaks to many cars to make them even more formidable. Visually, they received special Yenko badges and a “Stinger” hood patterned after the 1967 Corvette’s. And with that, the Yenko Super Camaro was born. 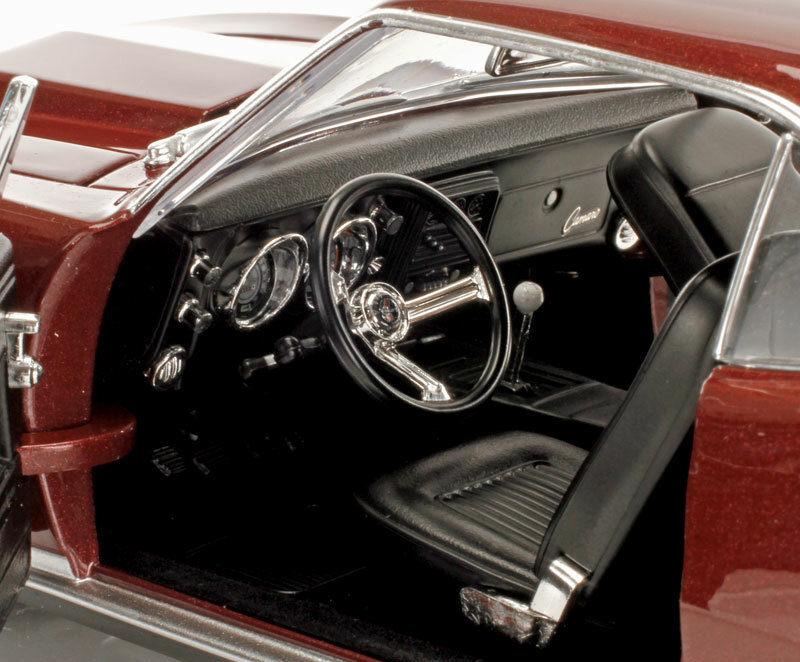 In much the same way that Yenko was known as the go-to source for specialist Chevy muscle, so Supercar Collectibles is known in the world of diecast muscle cars. They carry factory models from all the major brands, but some of their most interesting are their own creations: exclusive limited editions of muscle and race cars that fill gaps in the offerings available from the big manufacturers. 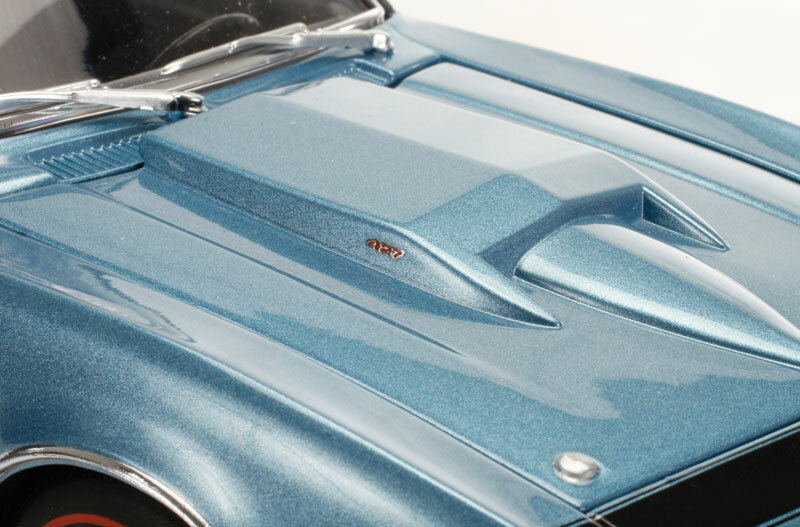 One such gap was the first-year Yenko Camaro, so they contracted with Acme Trading Company to use the Lane/Exact Detail tooling to produce three versions of the ’67 Yenko: street cars in Marina Blue and Madeira Maroon as well as a race-prepped Maroon car. Each will be available in a limited run of just 198 cars. I got a chance to preview the blue street car and maroon race car prior to release, and here’s what I found. The L72 427 out of the Corvette was the heart of the Yenko transformation. The model has scale-gauge plug wires and all the appropriate badges and labels. Etched badges and scripts adorn the nose, flanks, and rear valence. Both are RS/SS cars, so they have the nose stripe and hideaway headlamps. The Exact Detail Camaro tooling has been around a long time, but its proportions remain among the best ever offered in 1:18. The panel gaps aren’t quite as tight as they would be on a brand-new tool, but for my money, this is still the standard. The Marina Blue paint is gorgeous, with a superfine metallic sheen that practically glows and picks up every highlight. There are some slight irregularities on the foil that forms the border on the simulated vinyl top, which I likely attribute to this sample’s preproduction status, but otherwise the finish is first-rate. The maroon car’s paint is just as well executed, and since it is not a vinyl top, there are no such foil issues. Both cars have the Rally Sport option, with its hidden headlight grille, and each has a finely pinstriped “SS” stripe on the nose and delicately etched scripts and badges on the nose, flanks, and rear valence. Both cars have what appear to be hood pin/twist locks, but the detail on them lags behind the rest of the trim. Otherwise, the Stinger hoods are as spot-on as the rest of the car. The doors open nice and wide, and the hinges remain firm but are old-school dogleg style. Both cars have ’67-only triangle wing windows, and they fit pretty flush to the A-pillars. The interiors of the two cars are identical, and the detail is quite good. I like the chrome bezels on the instruments and the folding deluxe bucket seats, but I wish the model had included the Stewart Warner tach and supplemental gauge panel. The detail on the interiors is quite good, although the black color makes it a challenge to see fully in photos. Yenko did relatively little in terms of overt modification inside to create its Super Camaros, but it did add a Stewart Warner tach and supplemental gauges. Those are not present on the models. Such an option might plausibly have been left off the street car, but it really should be on the drag car. The factory gauges are present and accounted for, and the detail on them is excellent, including the chrome bezels around the primary cluster. The hinges on the bucket seats are chrome too, and they are functional, allowing the seats to pitch forward. The trunks open as well, and inside is a full-size spare redline on top of a trunk mat; there’s even a fuel-filler neck going from the center-mounted gas cap down into the tank below the trunk floor. 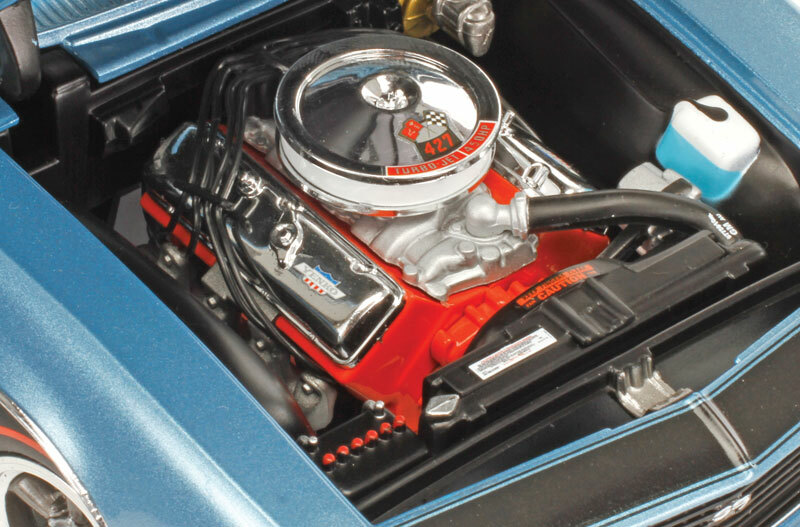 Hoisting that Stinger hood reveals the heart of the Yenko transformation: the L72 427. It wears chrome valve covers, a tall chrome open-element air cleaner, and an aluminum intake manifold. There is a set of plug wires of accurate-scale gauge and a nicely painted master cylinder. There’s even a wiper-fluid reservoir molded into the left fender, with the fluid level painted into it. The only things notably missing are the fender-to-radiator housing braces at the forward corners of the engine bay. All the requisite decals and warning labels—both factory and Yenko add-ons—are present. Both the race car and the street car appear largely the same, with the exception of the exhaust. The blue car has factory-style cast-iron manifolds, while the race car substitutes long-tube headers, which stretch below the car and terminate at the trans­mission brace, whereas the street car has a full-length dual exhaust system. 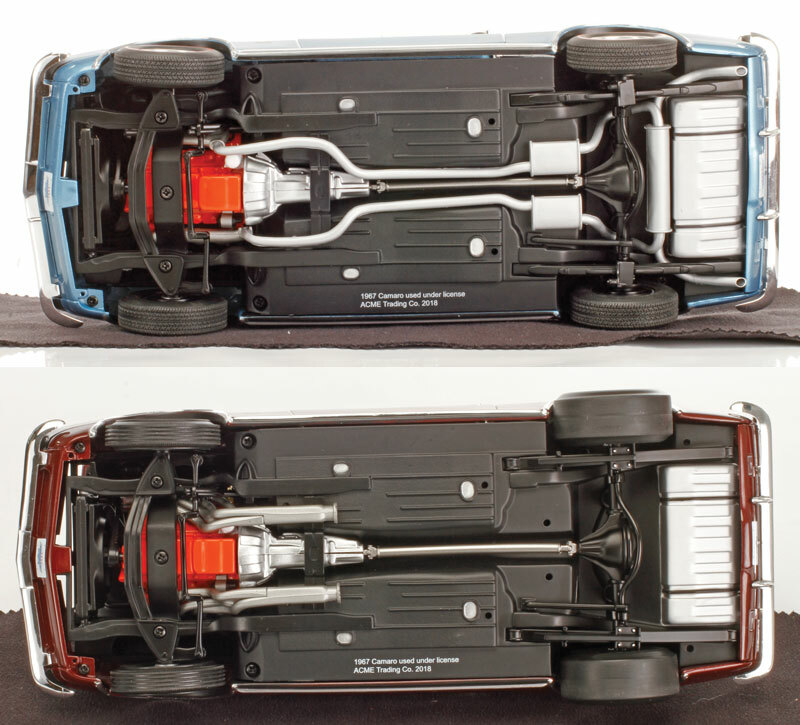 The biggest difference between the street and drag cars lies underneath. The road car (above) has the stock exhaust manifolds, full dual exhaust, and traditional leaf-spring suspension, while the drag car (below) has open headers, mono-leaf springs, and traction bars. While we’re under the cars admiring the realism of the exhaust setups, let’s also take note of the suspensions. The blue car has a stock setup, while the race car includes race-style mono-leaf springs and traction bars. Those suspensions match the wheel and tire choices as well. The street car wears redline tires mounted on very nice Atlas 5-spoke wheels with argent centers, which were a common option on later-year Yenkos. The race car wears another classic wheel brand: Cragar. These chrome 5-spokes wear super-skinny bias-ply tires up front and wide slicks out back. Each version has appropriate wheels and tires. The street car has redline tires mounted on 5-spoke Atlas wheels with argent centers. The drag car rides on chrome Cragars, with skinnies up front and slicks in back. Yenko is one of most storied names in Chevy muscle car lore, built largely on the strength—and speed—of its tuned 1967–69 Camaros. But far from just some hot-rod shop hammering out half-baked hop-ups, Yenko products were fully sorted and professionally built, with refinement that rivaled factory offerings—which has made them the most prestigious Chevy tuner of the era. The ’67 Camaro is really the car that elevated Yenko to the next level. The historic significance, the performance, and the aesthetic appeal all combine to make this a tremendous collector piece. I love the fact that Supercar Collectibles has chosen to do both a stock street version and a race version. With less than 200 of each scheduled for production using the evergreen Lane tooling, there’s no way these won’t sell out. If you have to have one (or all three), you’d better act quickly.